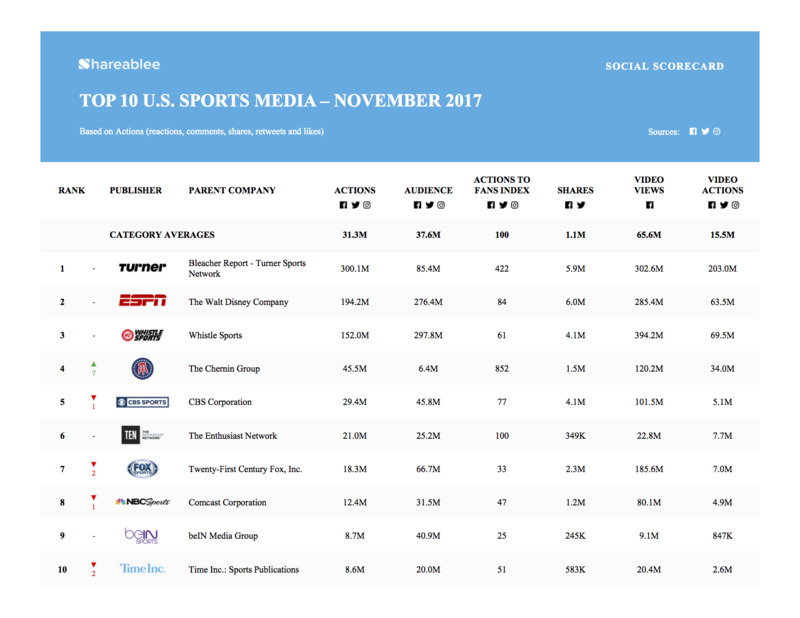 New York, NY, December 20, 2017	(Newswire.com) - Shareablee, a data-measurement and analytics company that transforms the world's social data into actionable business intelligence, today announced its Top 10 U.S. Sports Media rankings for November. Turner’s millennial-focused Bleacher Report brand led all sports media publishers in November in total actions – a composite of reactions, comments, shares, retweets and likes – with 300.1 million. Bleacher Report, which held the same spot in October, gained 11 percent among total actions, while also increasing its video views by 4 percent to 302.6 million. The top 3 remained unchanged from October, ESPN and Whistle Sports coming in at second and third, respectively. ESPN grew its Facebook video views by 30 percent to 285.4 million while Whistle Sport increased their total actions throughout Facebook, Twitter and Instagram by 10.8 percent. Barstool Sports, which finished in fourth, was the only publisher among the top 10 to see increases across all metrics: Actions, Audience, Shares, Video Actions and Video Views. For Barstool, actions grew 14 percent to 45.5 million, shares by 32 percent to 1.5 million and a 19 percent growth among video views to 120.2 million. Audience growth was 4 percent to 6.4 million. The Enthusiast Network was the biggest gainer among video views with 32 percent growth to 22.8 million. 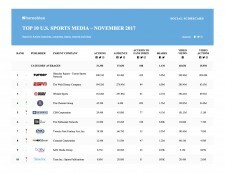 Whistle Sports had the most video views among all sports media with 394.2 million. NBC Sports grew its audience by 12 percent to 31.5 million. Shareablee is the leader in audience-based social media measurement for media publishers, agencies, and brands that want to understand the impact and effectiveness of their cross-platform social media campaigns. Founded in 2013 by Tania Yuki, and based in New York City, Shareablee has grown to over 60 employees in U.S. and EMEA offices, with clients in 15 countries. Shareablee has partnerships with comScore and Bloomberg, and is a Facebook Media Solutions partner.